People often ask if I send a new batch of cartoons to several magazines at once. The answer is no, I send in rotation i.e. I send the gags to one magazine at a time, then any that don't sell I will send to the next magazine on my list. And so on. The main reason is that you'd look a bit silly if several magazines wanted the same cartoon. And the editors concerned wouldn't be too happy about it. But there's another reason and it's this: sometimes they will print the cartoon before they've got around to telling you they're using it! Or there's some communication breakdown and you don't get the message. The above cartoon is a case in point. It is in this week's Spectator magazine, but I only found that out yesterday while browsing through the mag in in WHSmiths. 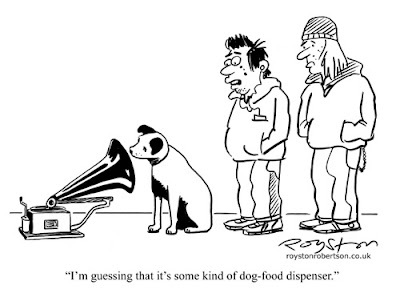 Regular readers will note that this is not the first time I've done an "HMV dog" cartoon. And it probably won't be the last. Funny cartoon. Just this past weekend I showed one of my old vinyl records to my five year old niece and told her this is how we used to listen to music. I don't think she could have looked more incredulous if I had been holding a flat rock...now if you'll excuse me, I have to go woolly mammoth hunting. Wilbur, it is on the site, among the January 5 issue cartoons. Unhelpfully though, there are no captions on the cartoons, so most of them make no sense!